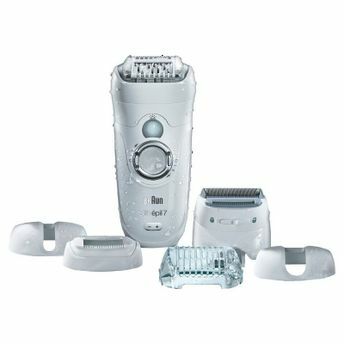 The Braun Silk-épil 7 epilator is 100 percent waterproof. For extra comfort and a soothing epilation experience in warm water you can confidently use it in the bath or in the shower.Never wait again for your body hair to grow so that wax can catch it. Braun close-grip technology catches hair as small as a grain of sand (0.5 mm). No more in-between days, no more hassle. High frequency massage system: With pulsating active vibrations - for an extra gentle epilation. Pivoting head: Smoothly adapts to body contours for superior comfort and efficiency. Wet & Dry: Works in bath or shower for a more comfortable epilation. Skin contour adaptation: Smoothly adapts to your body contours. Explore the entire range of Epilators available on Nykaa. Shop more Braun products here.You can browse through the complete world of Braun Epilators .